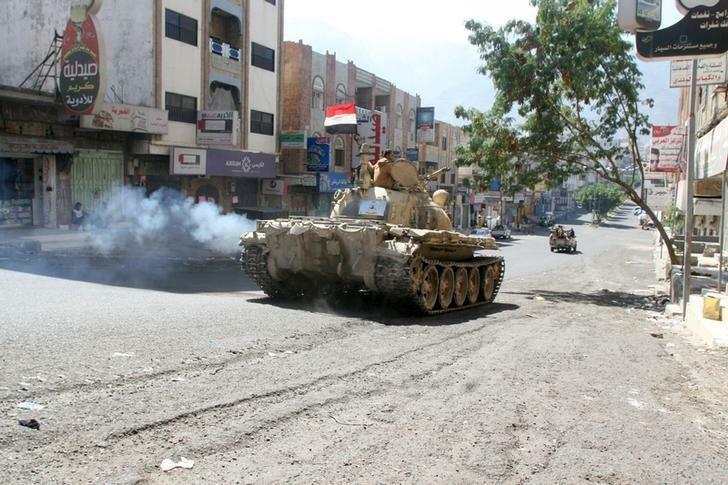 Taiz- Fierce clashes renewed between Yemen’s national army backed by the popular resistance and coup militias across Taiz. Iran-aligned Houthi militiamen and former president Ali Abdullah Saleh loyalists, forming coup forces fueling the nation’s civil war, have recorded grave losses as army forces advanced. Houthi field commander known as Abu Bassam was reportedly killed in the clashes. The onslaught has cost coup forces loss in artillery and personnel. Army troops backed by allied tribesmen launched a major push to dislodge militias from strategic locations on the eastern side of the city, so as to lessen their siege that suffocates the it. Battles escalated across the eastern axis of Taiz, by the time army forces –the 22nd brigade – made a swift and steady advance. Backed by the popular resistance, army forces were able to clear several strategic locations. Field sources told Asharq Al-Awsat that a number of areas have been liberated– in addition to the extensive combing through Mukalla and the Saleh district that overlooks the presidential palace and other important locations on the eastern edges of the city. Military sources revealed that battles extended across vast fields, as army forces retook militia-held locations. Tuesday’s offensive is part of a larger military operation aimed at pushing the rebel forces out of the country’s third largest city and putting an end to the miserable humanitarian crisis caused by the Houthi-laid siege and shelling. The large operation was launched in August when the latest round of peace talks ended without reaching an agreement. The government forces liberated the western side of the city and announced partially breaking the Houthi imposed siege. Colonel Mansour Al Hassani, a spokesperson for the Supreme Military Council in Taiz, said that his forces dislodged Houthi gunmen from some regions in the early hours of the offensive and are pushing to completely liberate other remaining areas in the coming days. “We have taken control of Saleh district that overlooks the presidential palace and other important locations on the eastern edges of the city,” he said. Al Hassani said the second phase of the operation began on Tuesday and will focus on expelling Houthis from the eastern side of the city where key government institutions like the presidential palace, college of medicine and Imam palace are based. “Our target is controlling the east side and cutting off Al Houthis’ supply lines from Sana’a that come through Al Houban district,” he said.